for the most vulnerable of human beings. AmnioBed™, our flagship product is in the research and development phase. The prototype for the device is built in our R&D facility in Pozega, Serbia and is currently undergoing pre-clinical safety testing by our engineers. AmnioBed™ is a highly complex device with 13 subsystems designed to ensure a safe, warm and clean environment for the most vulnerable of human beings. Funding for this round of Amnion Life provides for continued testing of each component and subsystem to meet the strict and necessary FDA and CE mark standards of safety. 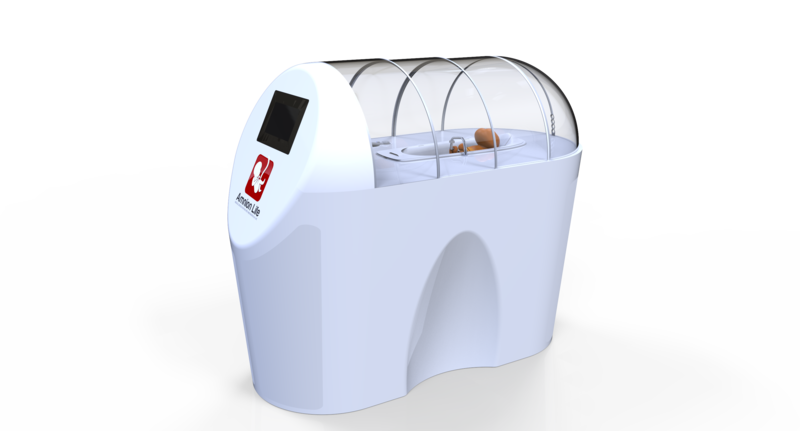 AmnioBed™ is fluid filled incubator intended to create a warm and safe environment for growth and development of preterm infants. Five Medical grade water purification filters eliminating heavy metals, contaminants, and microorganisms from the hospital water supply and bringing the water to dialysis grade purification standards. A medical grade heating system to create on-demand warm water at 98.6F. Significant safety mechanisms for fluid temperature regulation. Custom made disposable cartridges filled with concentrated electrolyte and mineral content. Computer operated dosing pump mixing concentrated electrolyte and mineral solution with purified water. Capability to adjust synthetic amniotic fluid osmolality from 280mosm/ml to 240 mosm/ml per medical team requirements and infant needs. Sterile and disposable bath cover and infant harness made of medical grade plastics. Safety chest and pelvic harness to prevent the infant from submerging into the fluid. Ergonomically designed infant bed for comfortable positioning of the infant. Comfortable and natural fluid environment for infant exercising of arms and legs. Continous filtration of bath fluid through medical grade UV filters. 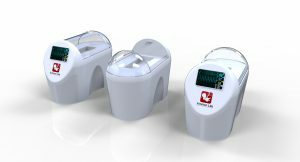 Fluid clarity sensor to detect stool and automatically flush bath fluid when infant defecates. Specially designed infant cap with built-in ECG sensors, EEG sensors, Infrared sensor, skin temperature sensor, O2 Saturation sensor and cap opening on the anterior fontanelle for ultrasound probe placement. Bridge and anchor over the fluid to protect the umbilical catheters from getting submerged. Audio and Video feed to a smart app on mother's phone for remote visual observation of infant at all times and for remotely speaking to the infant and exposure of the infant to mother's voice. In the Company’s target patient population of very premature and extremely premature infants and very low birth weight (VLBW) infants, there are many complications attributed to underdeveloped areas of the body, such as the lungs, heart, brain, muscle, skin, immune system and more. Premature skin, in particular, is very thin and fragile and permeable to water prior to keratinization at 26 weeks of gestation and has little to no subcutaneous fat for insulation. Upon premature birth, the skin is immediately compromised by exposure to air versus amniotic fluid present in mother’s womb. Many describe the delivery room as a hostile environment because it is such a shock and dramatic difference from the womb for the newborn. In the target patient population, this dramatic environmental change can cause serious complications, such as: hypothermia, skin break-down, dehydration, weight loss, pressure sores, alkaline burns (from exposure of skin to stool) and skin infections which can lead to sepsis (infection in blood) which can lead to serious organ injuries and even death. In addition, outside of the amniotic fluid, infant is exposed to evaporative water loss which in-turn effects the balance of water and electrolytes in the infant and requires largevolume of IV fluid administration for the infant. Large IV fluid administration to preterm infants has also be associated with organ injuries, in particular, lung injury (bronchopulmonary dysplasia). of hypothermia in this population. Hypothermia is a direct result of heat loss and can lead to other serious complications, such as weight loss, infection, neurologic/brain hemorrhage, respiratory/increased oxygen consumption, blood sugar volatility, coagulation defects, acidosis, delayed fetal-to-newborn circulatory adjustment, increased mortality and more. of radiation are believed to be biologically safe for the developing skin and eyes in premature infants. have been associated with risks of bacterial colonization, pseudomonas infections, sepsis and death. AmnioBed™ is a patented, breakthrough in incubator technology that incorporates synthetic amniotic fluid in a self-regulating, sterile submersion bath incubator system. 1. Kumar, S. A. (2009). Neonatal hypothermia in low resource settings: areview. Journal of Perinatology, 401–412. 2. Stuart R. Hart, M. B. (2011). Unintended Perioperative Hypothermia. Ochsner J, 11(3): 259–270. 3. Madhu Manani, Priya Jegatheesan, Glenn DeSandre, Dongli Song, Lynn Showalter, Balaji Govindaswami (2013). Elimination of Admission Hypothermia in Preterm Very Low-Birth-Weight Infants. 4. Soll, R. F. (2008). Heat loss prevention in neonates. 28, S57–S59 (doi:10.1038/jp.2008.51). To avoid heat loss in very preterm infants. (2004). 720-722. 5. Robin B Knobel, John E Wimmer Jr and Don Holbert (2005). Heat Loss Prevention for Preterm Infants in the Delivery Room. 25, 304–308. (doi:10.1038/sj.jp.7211289). To avoid heat loss in very preterm infants. The Journal of Pediatrics, 720-722, 720-722. 7. Ringer, S. A. (2013April). Core Concepts: Thermoregulation in the Newborn Part I: Basic Mechanisms. Neoreviews, VOLUME 14 / ISSUE 4. 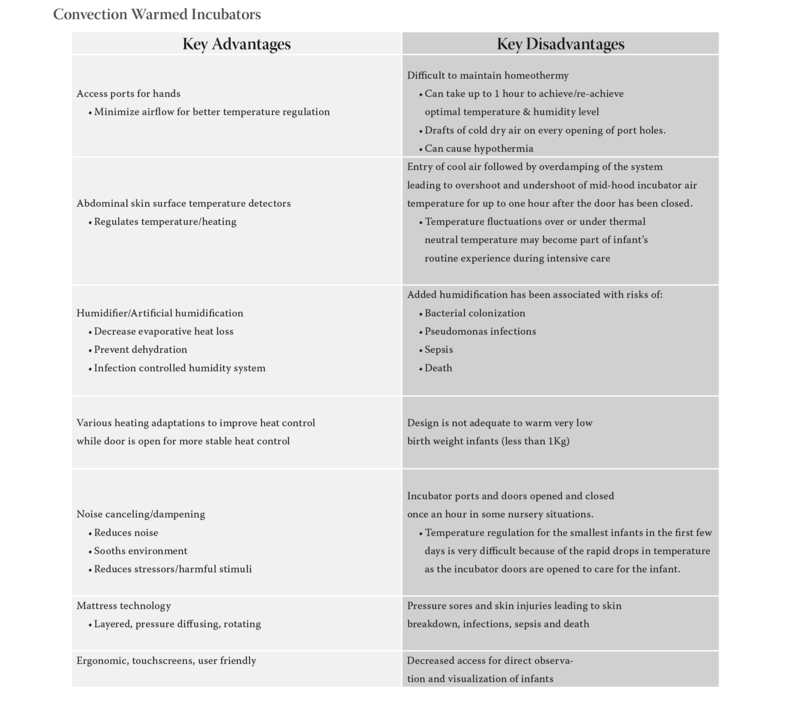 Neonatal thermoregulation. Infant, 101- 104. 9. Blackburn, S. T. (2012). Maternal, Fetal, & Neonatal Physiology4: Maternal, Fetal, & Neonatal Physiology. Elsevier. 10. RB Knobe, H.-D. T. (2009). Extremely low birth weight preterm infants lack vasomotor response in relationship to cold body temperatures at birth. Journal of Perinatology, 29, 814–821.